Till now we have successfully learned how to delete existing mappings, find MIDI messages that out controllers send to Traktor, adding custom mappings and using modifiers. If you are reading this for the first time we request you to please go through the following set of posts in order to fully understand this post and get it working. As soon as you select your controller you will see some values in the ‘Assignment Table’. Below there will be a button ‘Add In’; click this button to add mappings to our table. You’ll see a list with different traktor actions. In that list go to FX Group, a new list will open and in this list click on Effect 1 Amount. As soon as you click ‘Effect 1 Amount’ option you will notice that a line is added in the ‘Assignment table’ with some default values. This is the field in which we will be doing our custom mappings. Now click on Learn button and rotate your jog wheel from the side. 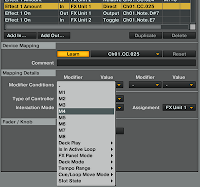 Assignment table will be updated with the MIDI signal value. Now is the time to put the associated modifier values as well. 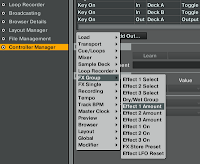 this ensures that when scratch button is on we don't want our jog wheel to control effects. To do this we have to put the same modifier values that we previously had while deleting the original mappings. To add modifiers Click on the box with a down arrow next to ‘Modifier Conditions’ with ‘Modifier’ label on top, in the ‘Mapping details’ section. Now select the modifier from the list that pops up. In our case the value was M4=0 (we found this in our previous post), so click on M4 in the list to select it. Since modifier value was 0 already we do not need to change the value, had it been something other than one we can change it by clicking on the down arrow under the label ‘Value’ in the Mapping details’ section. 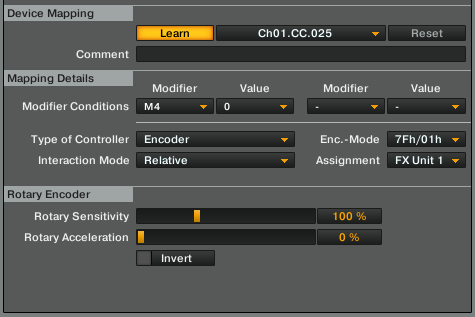 In the Device mapping section, just below the modifiers, click on the ‘Type of Controller’ drop-down arrow and select Encoder. 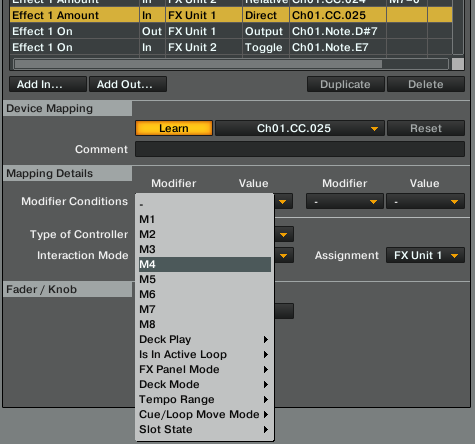 Tracktor automatically sets the interaction mode to relative. If it doesn’t set the Interaction mode to relative by clicking on its drop-down. 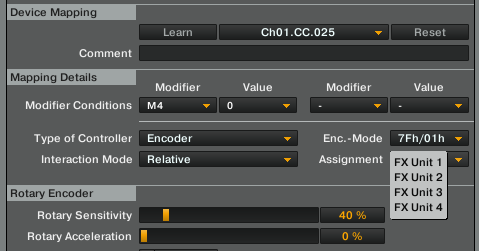 Also check for the Encoder Mode it should be set to 7Fh/01h. Now we need to set the Rotary Sensitivity for jog wheel. This lets us set the value of how much rotation do we need to make in order to make the effect amount to go from 0% to 100%. So let us suppose that we want to set our value such that for one full rotation of the jog wheel the effect amount should go from 0% to 100%. Typically we should set this to 40% which allows the above mentioned value. Depending upon your controller this value may vary. You can also experiment with this value and see how it affects your effect amount. Repeat the steps mentioned above and add mappings for Effect Amount 2 and Effect Amount 3 for both FX Unit 1 and FX Unit 2. Fx Unit can be selected from Assignment drop down as shown below. Finally we now want our Jog wheel to scratch the track when the scratch button is on. To do this add following value to your mappings. Remember you need to add two mappings one for Deck A and other for Deck B. And also this time the modifier values will be, for Deck A -> M4=1 and for Deck B -> M7=1. Congratulations! You've now successfully mapped your Jog Wheels to control Traktor effects. Did you find this helpful? Do add your comments and share your mappings here.